Reviewer's Note: This is part 2 of the Transformation series, preceded by Dark Intelligence. This review will not be mindful of spoilers from that book. The spoiler-free review is that this novel is a good read as a big, ambitious space opera but might leave you scratching your head even if you did read the previous book. 8/10. Picking up shortly after the events of Dark Intelligence, Penny Royal's pawns find themselves spread across the galaxy. Spear and Riss are back on the hunt for the rogue AI. Blite and his crew find themselves in the hands of a Polity forensic AI with a vicious streak and an obsession with Penny Royal. Meanwhile, Sverl emerges from the depths of Rock Pool to confront both Penny Royal and his nemesis, Cvorn. Penny Royal itself is putting pieces in motion, and all of the players in this game seem to move on its command. Like Dark Intelligence, War Factory is a fairly wild and complex space opera. With so many characters, Asher excellently balances the focus between them to the point that I never got tired of hearing from any one perspective, but he also keeps the constantly changing perspective from feeling jarring. The bulk of the novel is concerned with Sverl and the Prador, with Spear taking a backseat as far as the narrative goes, but no particular character is forgotten for long. What it does best is convey that there is a lot going on in this big universe, and where the focus is is on the important stuff. It also convincingly portrays Penny Royal as intelligence and capability beyond the world it inhabits, with inscrutable plans that sometimes feel like not even Asher knows where it's going. The third book in this series will tell whether or not we've been moving toward a satisfying conclusion, but I'm absolutely on board for more. However, this comprises my biggest gripe with War Factory. As the middle chapter, I'm not sure I'm seeing the arch of the trilogy plot beyond "Penny Royal is changing this universe, maybe for the better, maybe not". Penny Royal's motives are still largely unknown to me, even if this novel points to its origin and the actions its made may tell me more than I know. The plot of this novel is sufficient to read alone, but, like Dark Intelligence, it's difficult to tell if I'm not picking up on some of the overarching plot elements because they're not there, or I'm not picking up on them because this is the 14th book in this universe, and I've only read the most recent two. Regardless, War Factory is full of weird science and space, lots of complex characters, and healthy amounts of body horror. Don't expect to get every question answered but enjoy the ride and we'll see where we end up with the concluding chapter. 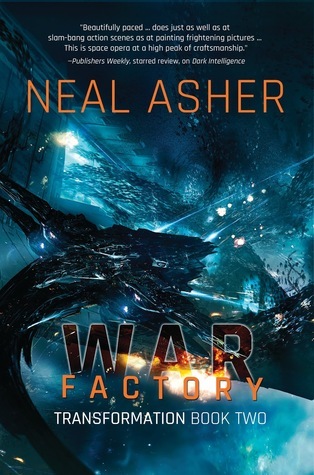 War Factory is an exercise in trusting the author, and I'm sufficiently impressed enough to continue to do so. Bonuses: +1 manages to make an inscrutable AI with believably unknowable plans. Penalties: -1 maybe those plans are unknowable because it has no plans and it's hard to tell if this is going somewhere that will make the whole better than the sum of the already good parts.